Bobcats' Small, Lakers' Beaulieu duel on the mound in tight 2-1 contest. RICHMOND — Their offenses were cold and their defenses were shaky, no surprise in an early season baseball game. Richmond’s Zach Small and Rangeley’s Bo Beaulieu, however, seemed in mid-season form while dueling from the first pitch to the last. 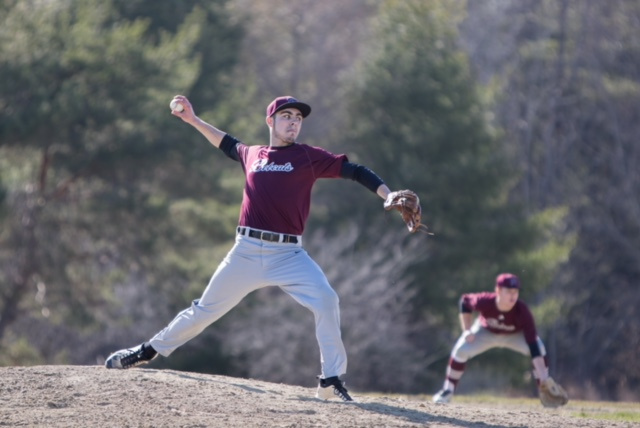 Photo by Jennifer Bechard Richmond pitcher Zach Small throws during a game against Rangeley on Tuesday afternoon in Richmond. The showdown went to Small, as Richmond broke a scoreless tie with two runs in the fifth and held on from there for a 2-1 victory in the season opener for both teams. Beaulieu matched him frame for frame, striking out eight and allowing three hits in six innings, but still getting saddled with the loss when defensive miscues resulted in two unearned runs in the fifth. TURNING POINT: The teams matched zeros through four and a half innings, but Richmond took advantage when Rangeley’s defense slipped in the bottom of the fifth. Damian Little reached on a dropped third strike, and after a balk, Ben Gardner grounded a ball through the third baseman’s legs for an error to puts runners at the corners. Beaulieu bounced back with a strikeout, but after Matt Rines walked to load the bases, Justin Vachon and Small reached on grounders to third and shortstop, respectively, that went as infield singles and scored Little and Gardner. Rines was thrown out trying to score on the play and Beaulieu induced a flyout to center to end the threat, but the damage was done. 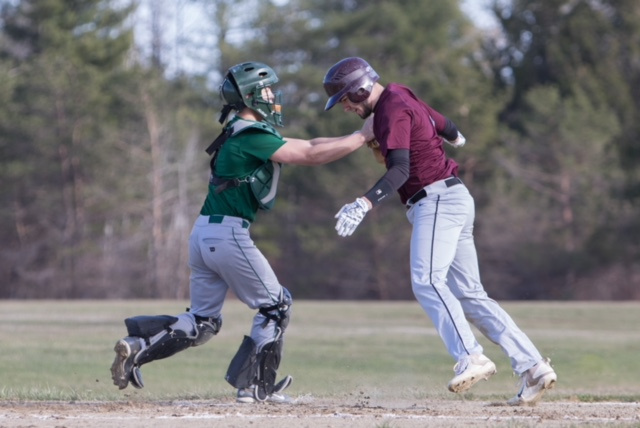 Rangeley coach Jeff LaRochelle acknowledged that the mistakes made the difference but didn’t blame his fielders, instead pointing out that Tuesday was Rangeley’s first time, in games or in practice, on a field this season. PITCHERS’ DUEL: Aside from the fifth, neither pitcher flinched. Small was terrific, fanning a batter in all but one inning and throwing first-pitch strikes to 19 of 25 batters. He didn’t walk anyone and reached two balls on a batter only once, and was touched for a run only when Rangeley’s Leo Perez reached on a bunt single and scored on a throwing error in the seventh. Beaulieu was up for the challenge of going against the Bobcats’ ace, striking out six in the first three innings and keeping the hard-hitting Richmond lineup at bay. Small said he was also fueled by the pressure that began to set in. 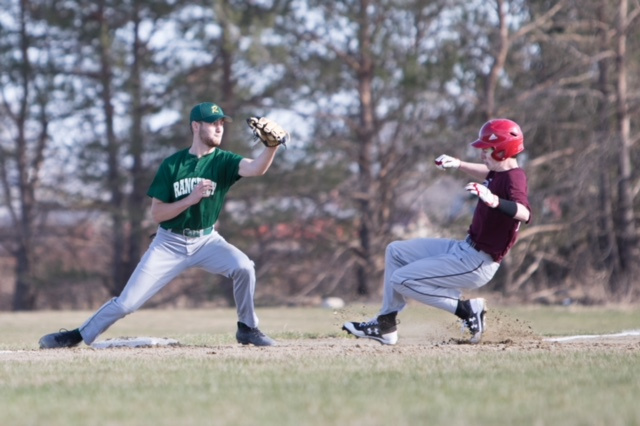 SHAKING THE RUST: Last year, Richmond beat Rangeley 12-4 on its home field. There were no big hits or big innings this time — not that that bothered coach Gardner. It was Richmond’s third day outside, and Gardner was confident the offense that carried the Bobcats to last year’s D South final would return in time.